TORONTO, ONTARIO--(Marketwired - Jan. 20, 2014) - Besra (TSX:BEZ)(ASX:BEZ)(OTCQX:BSRAF)(FRANKFURT:OP6) today filed its feasibility study for Stage One of its Bau project in Sarawak, East Malaysia. The feasibility study specifically covers the proposed open pit development at Jugan Hill to the northeastern end of the Bau Central gold trend and proposes average annual production of 116,000 oz per year from late 2015. Besra CEO, John Seton, said, "The release of the Stage One feasibility study confirms that this is an exciting and economically viable project. I'd also like to make it clear that this is only Stage One of a sizable multi-mine project with significant potential for expansion for many years to come. We have already commenced pre-feasibility studies on adjacent deposits to increase mine life to 10-years. 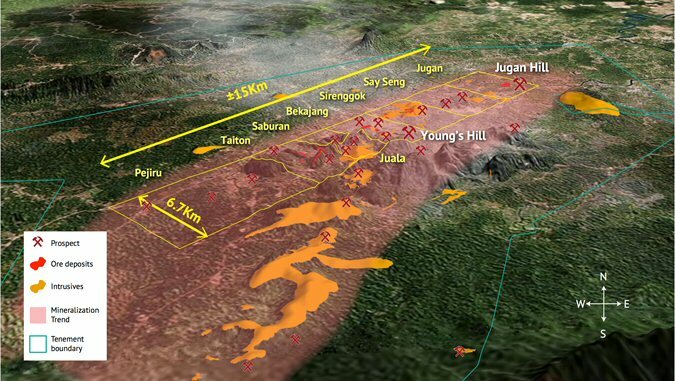 The fifteen kilometer long Bau gold field is open along strike and at depth at almost every deposit." Bau is a historic goldfield, which has been intermittently mined at surface for the past 150 years. Past production from these shallow pits is estimated to be around 3 million ounces. Since 2006, Besra has been consolidating mining tenure over approximately 350 sq km of the most prospective parts of the goldfield and systematically exploring multiple gold deposits and prospective zones. Current JORC/NI 43-101 resources stand at 21,285,300 tonnes @ 1.64 g/t Au for 1,124,900 ounces (measured + indicated) and 51,329,000 tonnes @ 1.32 g/t Au for 2,181,600 ounces (inferred). These resources reflect a low discovery cost of US$6.00 per ounce. Seton said, "Exploration remains at relatively early stage, with multiple deposits at various stages of exploration development and many prospective zones as yet entirely unexplored. Geological potential for substantially higher-grade mineralisation has also been identified at depth. The exploration success rate suggests that continued exploration has the potential to progressively expand resources and reserves over decades to come; with the potential to establish Bau as one of the major goldfields of Asia." Jugan Hill has been well defined through drilling to the current depths, the depth extent is less well defined and there remains open-ended potential to increase the resource beyond the current depth. Geophysical surveys and soil sampling campaigns have identified some nearby anomalies that will require further work and exploration/resource drilling. The remainder of the Bau goldfield contains thirty-six prospects or known deposits which are at the Inferred level or have suitable geological potential requiring an extensive amount of follow up work and exploration or resource drilling. The goldfield also needs to be tested at depth below these deposits/prospects to fully understand the significant depth potential in line with the Carlin similarity model and concept. Both the historical and recent Besra metallurgical test work on the Jugan ore deposit have demonstrated that the majority of the gold is associated with arsenopyrite and pyrite with the remaining gold present in silicious gangue material. The recovery of gold from the ore requires a gold pre-concentration step in a treatment flow sheet comprising crushing, grinding, desliming, and flotation to produce a high gold grade concentrate. For the base case and preferred option the flotation concentrate will be filtered to about 10% moisture, packaged and sent to an outside smelting or gold refining operation. The sale of a flotation concentrates offers the lowest capital expenditure, and the lowest operating expenditure as well as the highest return on investment compared with treating concentrates on site. As a result, significant savings will be made on capital costs and financing of the development should be attainable on more attractive terms. Besra is in discussions with Asian companies for a smelter off-take agreement, several of which have tested and confirmed their ability to process the concentrate. An indicative offer has already been received from one of the four smelters with more expected in the coming weeks. East Malaysia provides an encouraging environment for mining and foreign investment with a 0% gold royalty and 24% corporate income tax rate. Additionally, the Bau project is located 40 km via good roads from a deep-water port in the Sarawak state capital of Kuching, and within 30 km of Kuching International Airport. High quality infrastructure and services already exist and there is a supportive and skilled English-speaking workforce with good education levels and significant mining or quarrying experience. Once in production, the Bau project is estimated to be one of the top fifteen gold producing properties in Asia (ranked according to JORC/NI43-101 resources). By moving into production now, Besra can generate significant cash flow to further improve the gold field resources and reserves and take advantage of the opportunity for growth alongside the development of site infrastructure. Besra expects the property will ultimately assume a more prominent position as exploration continues to convert large-scale geological potential into resources. A copy of the feasibility study may be downloaded from www.besra.com/bau. Besra is a diversified gold mining company focused on the exploration, development and mining of mineral properties in South East Asia. The Company has four key properties; the Bau Goldfield in East Malaysia, Bong Mieu and Phuoc Son in Central Vietnam, and Capcapo in the Philippines. Besra expects to expand existing gold capacity in Vietnam over the next two years and is projecting new production capacity from Bau Central during late 2015. Certain of the statements made and information contained herein is "looking information"" within the meaning of applicable securities laws, including statements concerning our plans at our producing mines and exploration projects, which involve known and unknown risks, uncertainties, and other factors which may cause the actual results, performance or achievements of the Company, or industry results, to be materially different from any future results, performance or achievements expressed or implied by such forward-looking information. Forward-looking information is subject to a variety of risks and uncertainties that could cause actual events or results to differ from those reflected in the forward-looking information, including, without limitation, failure to establish estimated resources or to convert resources to mineable reserves; the grade and recovery of ore which is mined varying from estimates; capital and operating costs varying significantly from estimates; delays in obtaining or failure to obtain required governmental, environmental, or other project approvals; changes in national and local government legislation or regulations regarding environmental factors, royalties, taxation or foreign investment; political or economic instability; terrorism; inflation; changes in currency exchange rates; fluctuations in commodity prices; delays in the development of projects; shortage of personnel with the requisite knowledge and skills to design and execute exploration and development programs; difficulties in arranging contracts for drilling and other exploration and development services; dependency on equity market financings to fund programs and maintain and develop mineral properties; and risks associated with title to resource properties due to the difficulties of determining the validity of certain claims and other risks and uncertainties, including those described in each management's discussion and analysis released by the Company. In addition, forward-looking information is based on various assumptions including, without limitation, the expectations and beliefs of management; the assumed long-term price of gold; the availability of permits and surface rights; access to financing, equipment and labour and that the political environment in the jurisdictions within which the Company operates will continue to support the development of environmentally safe mining projects. Should one or more of these risks and uncertainties materialize, or should underlying assumptions prove incorrect, actual results may vary materially from those described in forward-looking statements. Accordingly, readers are advised not to place undue reliance on forward-looking statements, which speak only as of the date they are made. Except as required under applicable securities legislation, the Company undertakes no obligation to publicly update or revise forward-looking information, whether as a result of new information, future events or otherwise. The technical information in this press release has been prepared under the supervision of Mr Graeme Fulton who is a Fellow of the Australasian Institute of Mining and Metallurgy (AusIMM), a "Competent Person", as defined in the 2004 Edition of the "Australasian Code for Reporting of Exploration Results, Mineral Resources and Ore Reserve" and a "Qualified Person" as defined in National Instrument 43-101 Standards of Disclosure for Mineral Projects of the Canadian Securities Administrators. Mr Fulton is a full-time consultant to the Company and is not "independent" within the meaning of National Instrument 43-101. Mr Fulton consents to the inclusion in this press release of the technical information, in the form, and context in which it appears. About this company Besra Gold Inc.